Three times a year we hold special courses for school children from ages 5 to 7, aligned to the school terms. The Bushido Warriors beginners' courses are a great way to have fun and learn something new in an environment that's especially for children. Over the 12 week programme, we will teach the basics of Karate-Do, from bowing, to kicking, punching and also basic partner work. Through regular training, students will improve their balance, posture, self awareness, self confidence and self esteem. Parents and teachers continually report on the improvement in the behaviour of children who train regularly. In the final week, we will review what we’ve learnt over the previous weeks. 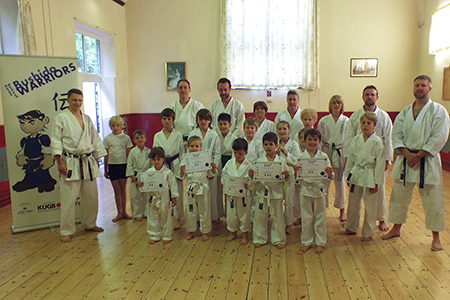 Each child that completes the course will be named as a Backwell Karate Bushido Warrior and will receive a certificate of graduation. Classes currently take place on Friday evenings during school term time, from 5.50-6.30pm at Backwell Parish Hall. Our January course is now underway. Our next 12 week course starts on Friday 26th April 2019 and we are currently accepting registrations. As soon as the course is full we will operate a waiting list for the next course, so if you'd like your child to take part then please register as soon as possible. To register your interest for the next course, get in touch using the email address or enquiry form on the right. Bushido WarriorsTM and the 'Takeo' Bushido Warriors character are trademarks of Backwell Karate. All rights reserved.